The Wild West. A time when six-shooters made the law, vigilantes strung up horse-thieves, you chose whiskey or water, and you bathed maybe once a week. Life was hard. Fate forged a man just as much as tough circumstances. Harsh but honest men found themselves behind a badge, while a cruel twist of fortune might just push some to the other side. Others drifted through life a loner – not having to help, or rely on, others. Yeah, sometimes you had to travel the path that the cards dealt. And there were always men to stand in your way. Well, the table ain’t big enough for you all, and Colt and Winchester stand as judge. When the dust and gunsmoke settle, everyone will see who are the quick and who are the dead. Bang! 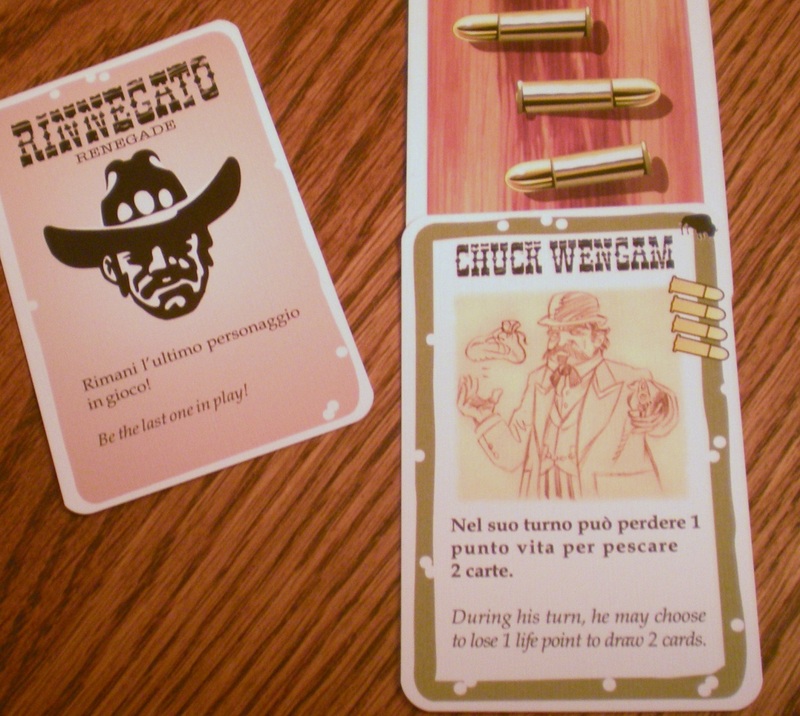 is a fast-paced card game of a gunfight. Sometimes it seems like you’re ducking and running through a frontier town’s dusty streets, rickety boardwalks, and dark alleys. Other times, it feels more like a straight-up showdown in the vein of the Earps and Doc Holliday toe-to-toe with the Clanton’s and McLaury’s at the O.K. Corral. Except in Bang! no one knows who is on what side of the law! The contents: Tons of cards and one badge. The gist of the action consists of playing BANG! cards to shoot other players. Ideally you don’t want to shoot your allies, but you probably will. At least at first. Out of ignorance. You see, all players begin the game with a random, secret role and no one knows who is who. Except for the sheriff who reveals his star, which feels like the big, fat bulls-eye it will very soon become. This is thematic enough since everyone in town knows the sheriff. After all, they voted for him. And even if you’re an out-of-town bad guy just drifting in, you’ll easily discern him by his stinking badge. The sheriff’s allies are his deputies, who remain secret despite their own stinking badges, and together the lawmen must kill all of the outlaws and the renegade. 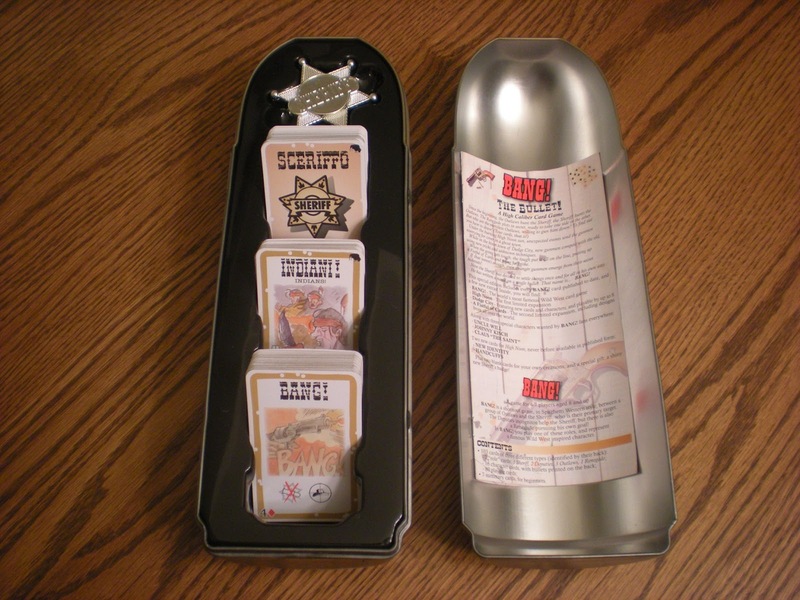 The outlaws’ anonymity is logically explainable for the game’s theme and together they want to send the sheriff off to Boot Hill in a pine box. Finally there is the renegade, whose identity in real life would no doubt be compromised by his social shortcomings, but for the purposes of the game aims to be the last man standing. I’m gonna need a bigger gun! But attaining those victory conditions can be just as crazy as the West was wild. To shoot someone else, you must play a BANG! card. However, at the beginning of the game, your gun only has enough range to hit the person sitting next to you. 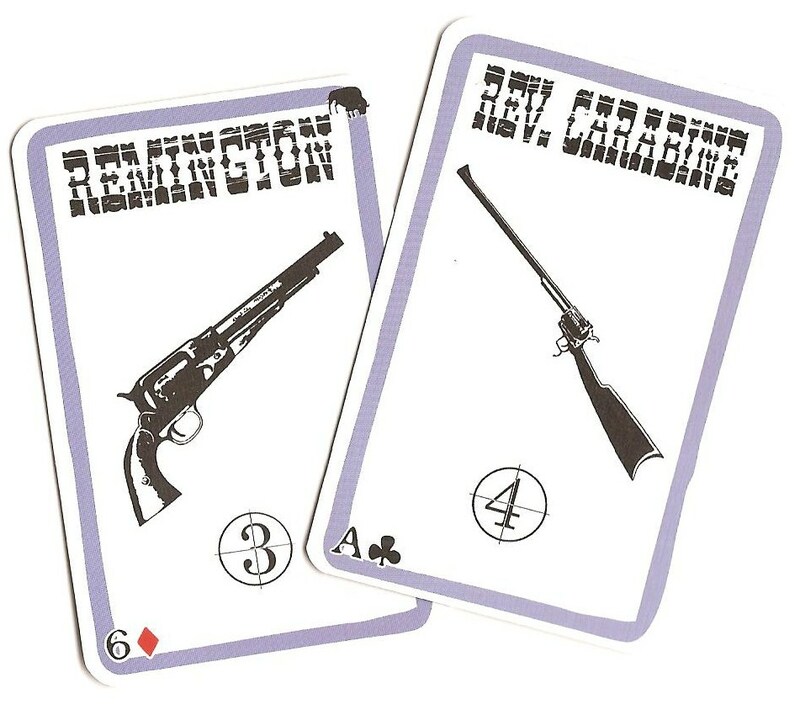 To really send the lead flying, you must play cards like a Remington which gives you a bigger gun to shoot farther, or a Scope which decreases the range of your current weapon, or even a Gatling Gun which hits everyone at the table regardless of where they sit! Others can have cards like a Mustang which increases the range between you and them, or they can even play a MISSED! against your BANG! which sends your bullet ricocheting off the nearest hanging sign with a forlorn echo. And that’s not nearly the limit of card effect possibilities. There are cards that let you heal wounds, draw cards, steal cards, trash cards, ambush, duel, and even put others in jail. You can even send a pack of dynamite around until it blows up on some random player – maybe you! You begin the game with a number of cards equal to your life points which depends on what character you are. This is different from your role – sheriff, outlaw, deputy, or renegade. Instead, your character (which is not kept secret) gives you some nifty, unique, rules-breaking ability. You are randomly dealt two characters before the game and you pick one of them to play. 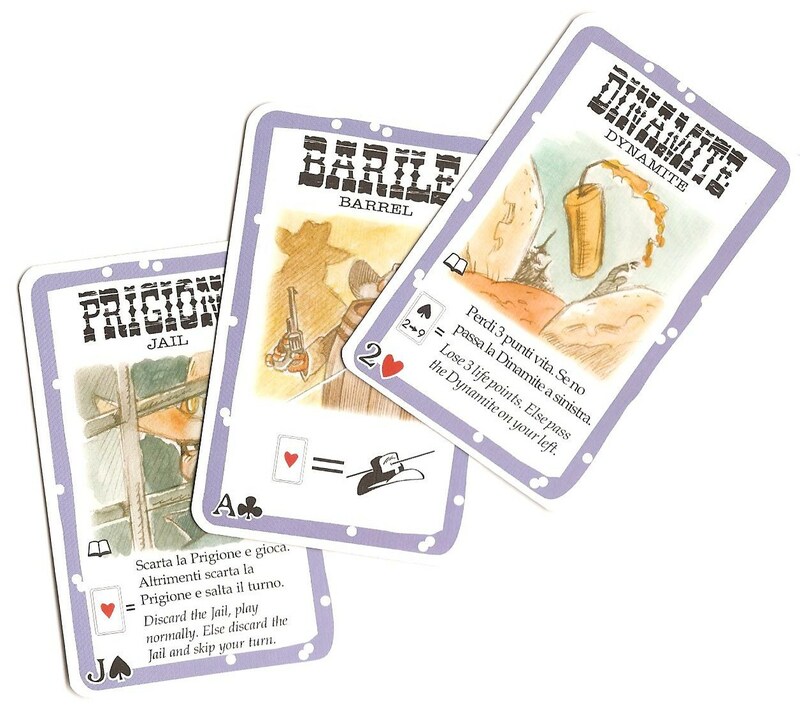 In addition to giving you a funny homage to the game’s theme – like Kit Carlson, Calamity Janet, and El Gringo – it also assigns you 3-4 life points, denoted by bullet casings. The Sheriff gets an extra life point for his troubles as an early sitting duck. Every time you are hit with a BANG! and cannot deflect it, you lose one life point. Lose them all and its nickels on the eyes. Role (at left) and character (at right). Each turn, you usually begin by drawing two cards and then playing any and all cards you wish, and that are legal. The one major limitation is that normally you are only allowed to play one BANG! card per turn. So make it count! However, there are some non-BANG! cards that can also inflict wounds, presenting other possible fun and deadly combinations of mass mayhem. Standard cards are discarded when played. Blue bordered cards are laid in front of you and have lasting effects until another is able to steal or discard it. Green bordered cards must sit in your tableau for one round until you can apply its effect, which gives others the chance to trash or swipe it before your next turn. As players die, they reveal their secret roles – almost always to lots of crying, howling, derision, laughter, and Homer Simpson-style “DOH!” forehead slaps. There is an interesting penalty and bonus to watch for closely. If the sheriff kills a deputy, he must discard his entire hand and any cards already in play in front of him. Also, anyone who puts the final bullet in an outlaw gets to draw three cards as a reward – even if it’s another outlaw! As soon as one team/person meets their victory condition, the game rides off into the sunset. I’m reminded of a line from Support Your Local Sheriff – a hilarious western spoof that should be a prerequisite to playing Bang! Another hired gunslinger has just rolled into town to kill the sheriff just as he sits down to lunch. Complaining to Ms. Purdy about the outlaw’s inconvenient timing as he sets his tray down, the damsel asks if he’s really going to kill another man. “Well, I’m sure we all hope it turns out that way,” he intones. Bang! is an entertaining romp that doesn’t pretend to be strenuous, while still offering fun choices, but never taking itself too seriously. Mechanics-wise, this title is very approachable for a broad range of ages and gamer types (although those of you only into serious, strategy games should probably ride a different horse). The rules are simple and straight-forward, though admittedly a practice game is recommended to learn the ropes. Game play is fast-paced with lots of action and little downtime. True, in larger sessions you’ll sit a tad longer before your next turn. But often others will be shooting at you or playing other cards that also require a response on your part. Even if not involved in the action, you need to pay attention to how the others are playing in order to determine who is who. And after you’ve figured that out, it’s still humorous to watch the gunfight unfold. For those who dig theme in their gaming, Bang! has it in spades. Indeed, speaking of spades, there’s still another thematic element I haven’t mentioned that uses poker card suits for more random joviality. The whole game you’ll be shooting, dodging, and taking lead in this high-stakes shootout. 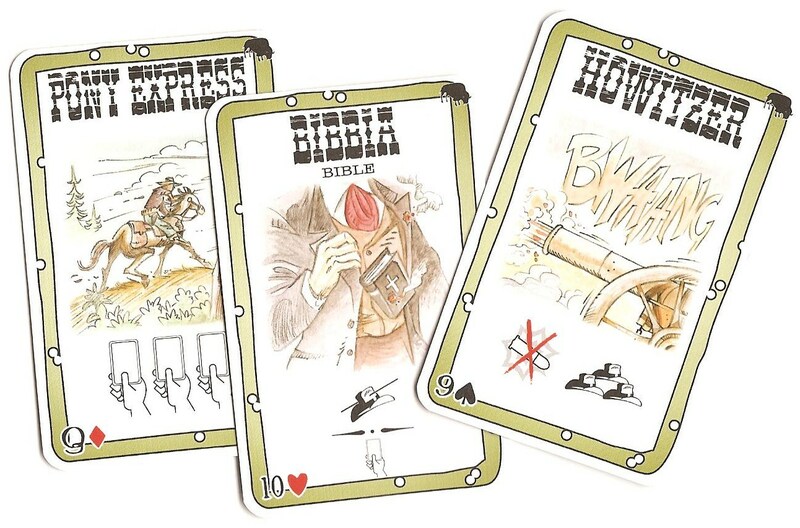 Every card touches upon some familiar western movie prop, trope, or cliché with light-hearted artwork. The inclusion of Italian text really enhances the theme even further. The good variety of cards provides more than just straight-up shooting to give you some tense, but appropriate choices without claiming to be strategic. It allows you to get into the game’s mood without overtaxing the brain. The Bullet! 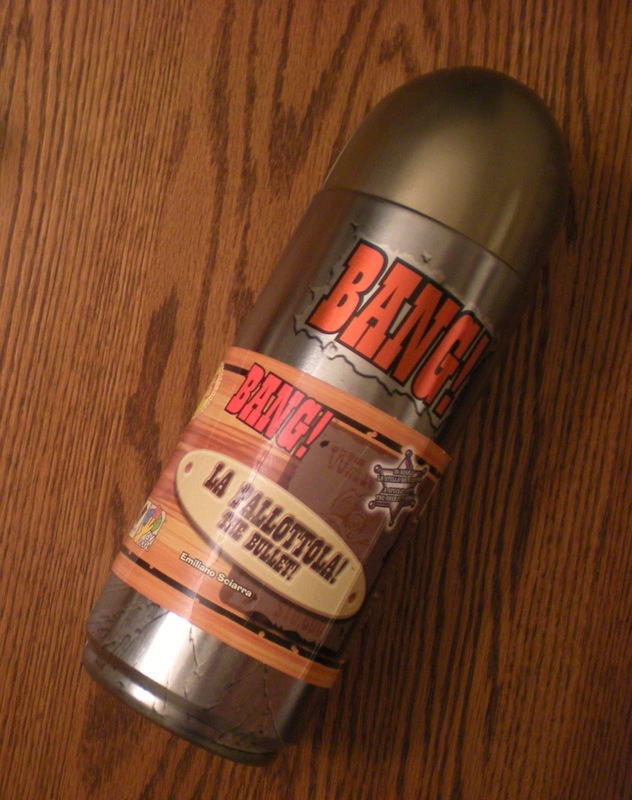 edition comes in a thematically awesome, bullet-shaped container. Okay, so this may be a pain as far as practical storage considerations go. OCD types may nervously twitch like the town drunk, but I give DVG props for it. It also includes a shiny, plastic sheriff’s star that serves no useful purpose whatsoever, and I love it! But the edition’s greatest asset is value. In addition to the base game, in offers three expansions for one great price. 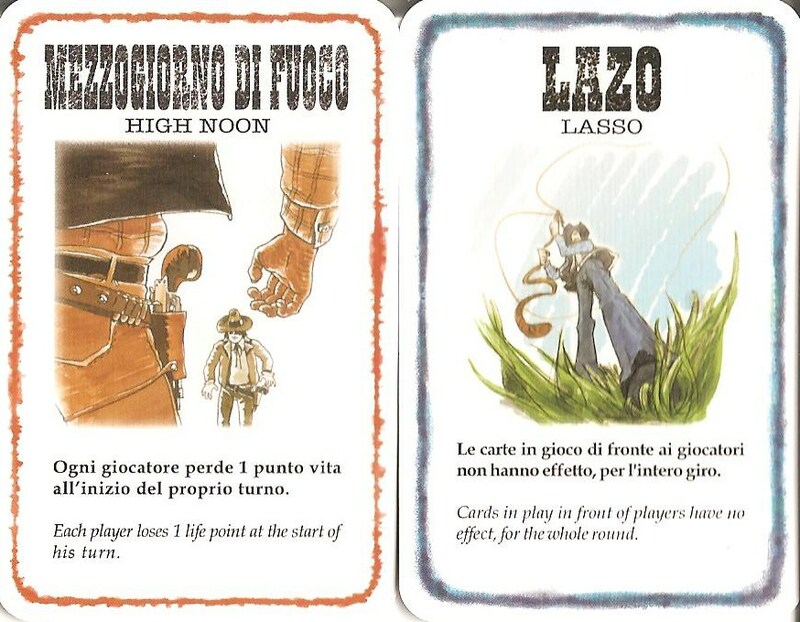 ‘High Noon’ and ‘A Fistful of Cards’ both provide a large bang for such a small deck. Each card in these decks randomly and radically changes the rules for one round apiece. In addition to adding variety and hilarity, it can often speed up the game by negating the cards that deflect bullets or heal wounds, and etc., which tend to extend the game’s life (see below). A few even inflict damage outright! The larger expansion, ‘Dodge City,’ offers extra characters, cards, and rules. It expands the game to eight players and includes a three-player variant, which I cannot recommend. There are two potential issues with Bang! that will vary in degree depending on the individual player. One, the game can run long for what it is. Most gamers won’t want to spend an hour plus on a light, silly, frenetic, and highly random card game. Not to worry too much, as the majority of games typically run under 45 minutes. Ironically more players do not automatically translate into a longer sitting. Often times it proves quite the opposite. Extra guns equal more flying lead which can mean more wounds and quicker demises. Actually game length can vary erratically between sessions. 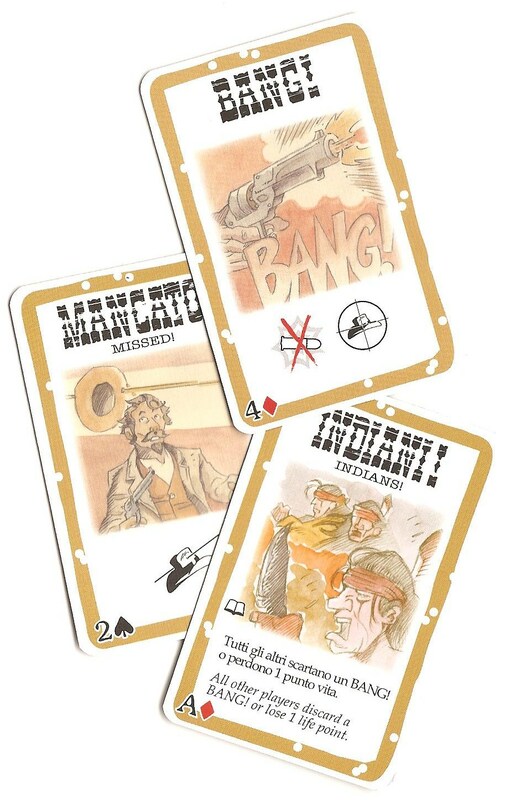 If the cards fall right and two outlaws end up on both sides of the sheriff, the whole affair can end quicker than you can say, “Randolph Scott.” On the flip side, we have experienced some games that overstayed their welcome simply because of the deal – recurring hands that negated numerous BANG! cards or constantly re-healed the mortally wounded or kept superior firepower just out of range, and etc. I really enjoy Spaghetti Westerns. I just don’t want to play the game version in the same amount of time it takes to watch one. The other potential pitfall for some gamers will be the player elimination. A lot of hobby gamers abhor it and some casual gamers may be put off by it. But it’s not necessarily just the mechanic of elimination, but the fact that you can be eliminated very quickly in this game. This will be particularly bad for players who are sore losers or often feel like they’re targeted – because they will be! This issue is also easily compounded by the aforementioned issue. If a session does go overly long, eliminated players will get restless – especially so if knocked out in the first few rounds. Dodge City adds the green-bordered cards. While those cons are legitimate when they occur, they’re usually in the minority, and the optional expansions may very well address the problem in many cases. Overall, Bang! is a light and funny title that straddles the divide between party and hobby game. It will not tax your mental capacities, but it will tickle your fancies. With a wonderfully immersive theme, this amusing title is a great choice for larger groups in good humor looking to wind down or ham things up a bit. Doubly so for western fans.